Candidates eagerly waiting for NDA 1 2016 admit card which will be soon available on this page once its officially declared by UPSC. Aspirants who are looking and always wanted to join Indian Armed Forces as an Officers have a good news as NDA ( National Defense Academy) has issued a recruitment for young cadets for NDA 1 2016 written examinations. Candidates who are eligible and interested can go through the article and apply online for NDA 1 2016 from the steps given below and can apply online on or before 2016.Feel free to ask question in below comments. National Defense Academy (NDA) Exam is conducted twice in a year by Union Public Service Commission for the recruitment of eligible candidates for Indian Army, Indian Air Force, and Indian Naval Academy. UPSC has released the schedule for NDA 1 2016 examination. The notification for NDA 1 2016 entrance card will be released on March 2016. The candidates can read the details of eligibility and age criteria, details about the exam, and other things in the advertisement. They can start filling up the forms then only. Candidates can fill up the forms online on the official website of UPSC ie www.upsc.gov.in. Aspirants who are looking for such described jobs training must apply in NDA 2016 by filling the examination form. Aspirants must fill the asked details accurately and the form must be submitted before the last date of apply. Eligible Unmarried Male candidates who are currently in Class 12th or have passed class 12th can apply for NDA 1 2016. For Army wing of NDA Physics and Math’s are not a must in Plus 2 level however for Navy and Air Force they are a must. Candidates must lie between age of 16 ½-19 ½ Years (On the first day of the month in which course is due to commence). Candidates have to pay Rs. 100/- in the form of cash in any branch of SBI bank or by using net banking. No Fees for SC/ST Candidates. The written test consists of two papers each of 300 marks, Paper I consists of Mathematics of plus 2 level and Paper II is of General Awareness. There are 4 alternatives for the answers to every question, so every wrong answer there is 0.33 marks deducted to that particular question. If the candidate give more than 1 answer, then it would be treated as wrong answer, even 1 of the answer given by the candidate is right, will be treated as penalty. If blank answer is given i.e left blank by the candidate then no marks would be given to that question. Date of Exam: 17th April 2016. How to Apply: Eligible Unmarried Male candidates may apply online through the UPSC Official website www.upsc.gov.in from 2nd January 2016. 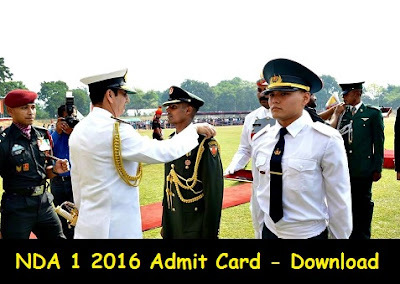 How To download NDA 1 2016 admit card ? Aspirants must visit the official website to apply online on or before 2nd January 2016. Visit the official website of UPSC ie www.upsconline.nic.in. Take the printout of entrance card and keep it safe with you. Aspirants will get selected on the basis of written test. Then shortlisted aspirants will be called for SSB (Service Selection Board). Know about Complete SSB.